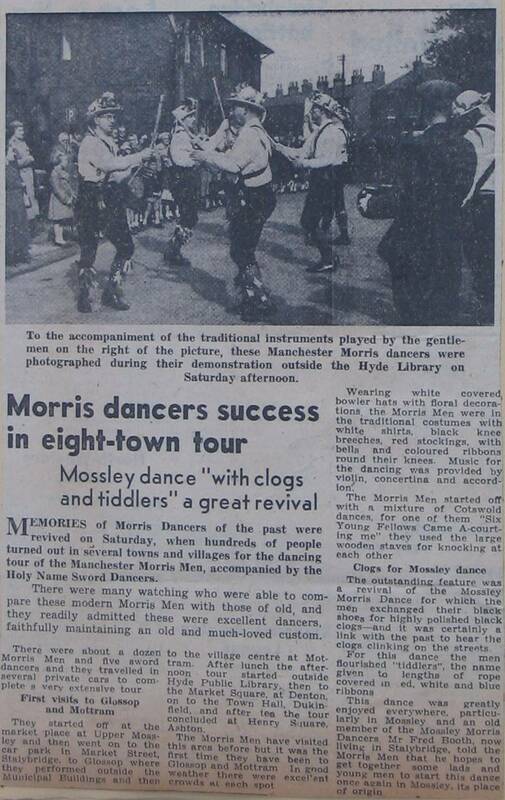 Initially, Manchester Morris Men only danced the Cotswold morris from Oxfordshire and the midlands. In the 1950's we revived several of the local dances and also started to wear clogs for these dances. by 1957 Wide, Lancashire style sashes replace baldricks, and then by 1961 there is braid on our breeches. After the Midsummer break we came back refreshed for the tour on 3rd September in the Hyde, Mossley, Stalybridge, Ashton area. We had been dancing the Mossley Morris during the summer but now we were provided with clogs for the first time and this made a big difference. We gave eight shows during the day, starting at Upper Mossley to a good crowd and finishing at Ashton to the biggest of the day. The Holy Name Scouts' Sword Team joined as after lunch and provided a welcome variety to the displays of Morris. This is by far the best tour of the summer in terms of crowd, weather, enjoyment and collections and it put us in good fettle for the Ring Meeting a fortnight later. We get good newspaper publicity on this tour and crowds are very responsive to the Morris, particularly the Lancashire variety which is still a living memory to many in this area. This is an industrial region of chimneys and cotton mills, and the settings are not of the village green type, but it is genuine Morris territory.